Where Justice and Mercy Meet: Catholic Opposition to the Death Penalty comprehensively explores the Catholic stance against capital punishment in new and important ways through a number of essays by faculty from Mount Saint Mary's University in Emmistburg, Maryland. The broad perspective of this book has been shaped in conversation with the Catholic Mobilizing Network to End the Use of the Death Penalty, as well as through the witness of family members of murder victims and the spiritual advisors of condemned inmates. The book offers the reader new insight into the debates about capital punishment; provides revealing, and sometimes surprising, information about methods of execution; and explores national and international trends and movements related to the death penalty. It also addresses how the death penalty has been intertwined with racism, the high percentage of the mentally disabled on death row and how the death penalty disproportionately affects the poor. The foundation for the church's position on the death penalty is illuminated by discussion of the life and death of Jesus, Scripture, the Mass, the catechism of the Catholic Church, and the teachings of Pope John Paul II. Written for concerned Catholics and other interested readers, the book contains contemporary stories and examples, as well as discussion questions to engage groups in exploring complex issues. 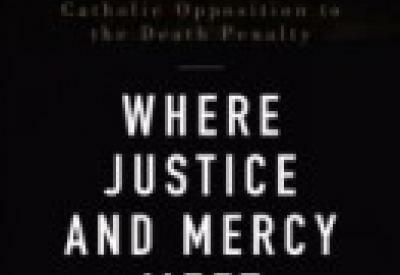 Where Justice and Mercy Meet: Catholic Opposition to the Death Penalty received a first place award in the 2014 Catholic Press and Book Awards “Faithful Citizenship” category. This is the second national award presented to the editors, authors and publishers of this popular, thought-provoking book. In May of 2014, the book received the Association of Catholic Publishers “2014 Excellence in Publishing Awards” in the “Theology” category.